Chairperson Noida Chapter, Manjula Mishra thanked the MSME friends for the positive response from them. She mentioned that the Expo made a humble beginning but is expected to go a long way in the years to come. She also mentioned about the Buyer-Seller meet to be held tomorrow. Mr. Ravi Agarwar talking about the partnership program with IIA where they do various activities to induce the growth of MSME sector. Social Entrepreneur Dr talking about the need to have a conducive environment for the growth of MSME sector. Noida is the pride of UP but its important for all of us to maintain law and order in Noida. Noida has its own dark side, which sometimes restricts growth. Chief Guest Dr Kumar, NSIC compliment the IIA for holding such a great show, and congratulated the exhibitors for their stalls. Noida is a city of entrepreneurs. In the past 20-25 years so many new enterprises have come up in and around Noida, it has become face of industry for India. Dr Kumar salutes the spirit of entrepreneurship in Noida. Dr Kumar gives approval for a new branch of NSIC in Ghaziabad, provided research says its going to be self sustainable. As it is a mandate for all NSIC branches to be self-sustainable without any funding from Government. Dr Kumar mentions that as per the new govt policy 20% of the annual purchases of the Governmnet have to come from the MSME sector. The NSIC is the nodal body which would do the capacity assessment and certification of the suppliers. This is called the single point registration scheme. Rapid incubation program is a program to help a new business. it provides a complete hand holding to the new businesses, from giving new training to placing the product services in the market. This program is being demanded by various other countries as well. Opp. Shipra Mall (Indirapuram) Noida-201301. 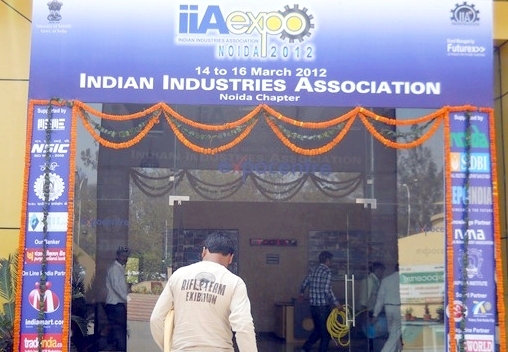 Timing : 10.00 A.M. to 8.00 P.M.
IIA EXPO 2012 is being organized by Indian Industries Associatin, Noida Chapter. IIA Expo is aimed to provide business opportunities and a global connection to the MSME fraternity worldwide. The event is poised to become an excellent platform to establish contacts, enhance export/import, understand latest marketing trends and exchange views & ideas. IIA Expo will be a window for increased investment, latest technology and promotion of contract manufacturing from large enterprises and PSUs. Opening new opportunities for MSMEs. IIA Expo is the 2nd MSME expo in Noida and has now become an annual event. This year it will have participation of more than 200 exhibitors. Trade Exhibitions are very important tools for marketing and growth. IIA Expo will be especially beneficial for MSMEs in Noida and is already creating a strong buzz in MSME circles.